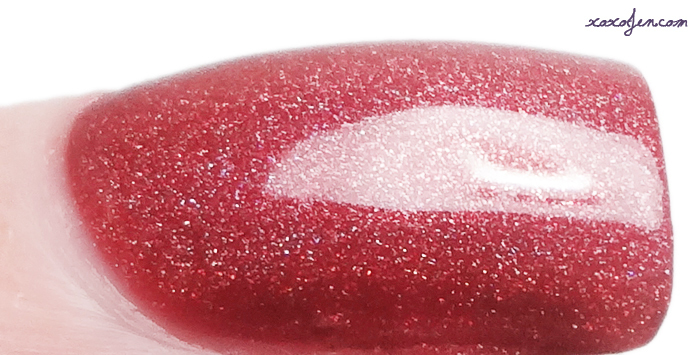 KBShimmer's Men Are From Mars-ala is based on Pantone's color of the year for 2015, Marsala. I had the opportunity to review the polish and jumped at the chance! I do have to admit that when Pantone announced the shade, I was a bit underwhelmed because my first thought was how it would translate to polish - but my mind was quickly changed when I received KBShimmer's holographic version of the color. Men Are From Mars-ala looks to have a mauvey base color, but the holographic rainbow can make it look more pink or orange which makes it a really fun color to wear. In fact, if you google search images you'll see several different looking shades for this one polish! And really, it looks like all of them. The formula for this polish was smooth and fluid; easily applied and controlled. It was almost opaque in one coat, but I used two coats to ensure even coverage across the curve of my nails. With my review kit, I received KBShimmer's prep to finish products which I used for this manicure: Unscented Cuticle Oil Pen, Nail Prep pH Balancing Pre-Polish Nail Treatment, Basic Training Nail Polish Base Coat, Clearly On Top Quick Dry Top Coat. I was very excited to receive these, as Clearly On Top is my very favorite top coat and I've been wanting to try the prep and base. I've worn my mani for about five days and so far I only see the usual tip wear, no chips. The cuticle oil is packed full of skin loving oils and was super easy to use with the brush tipped applicator pen. After use, my skin was left feeling moisturized and looking great. 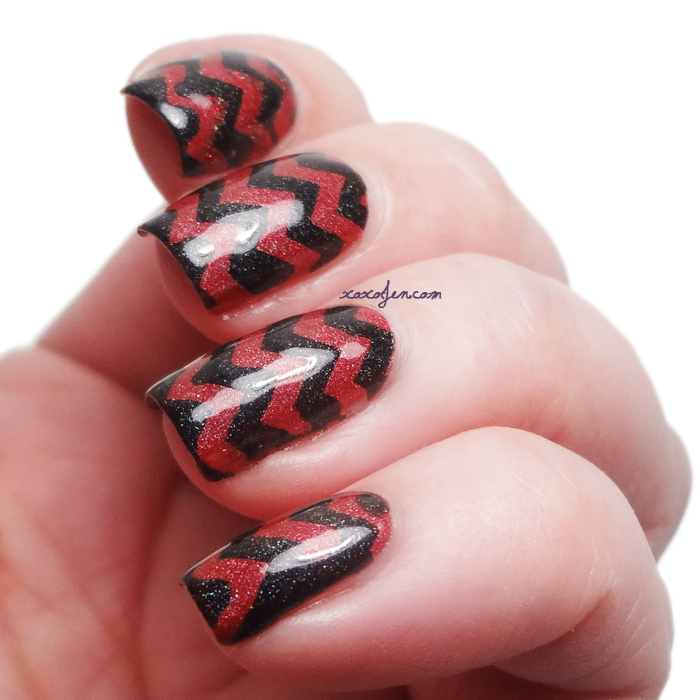 I also received zig-zag nail vinyls to try out so I chose a black holographic polish for contrast. This is my second time using vinyls and I had a little bit of trouble getting them to stick down along the free edge on the sides of my nails. I think it's because I have a pretty curved c-curve. I think it still turned out really well though, what do you think? You can get your very own holographic color of the year and many other great products at the KBShimmer online shop. Great color on a holo polish and I just love the chevron nails you did with them. Hi Jen, the more swatches I see of "Men Are From Mars-ala", the more certain I am that I'll be purchasing it. Thanks for your gorgeous swatches of it! Your photography is just beautiful. You're welcome and thank you for the compliment! I must say marsala is not my favourite shade of red, so this is going to be a quite bad year for me, polishically speaking (even if I bet my wallet's having a party because of this LOL). BTW This KBShimmer looks oncredibly amazing and I've been loving it since the very first pic! Your combo with black is gorgeous! Thank you so much for the comment! I can understand not loving the shade - I felt that way too until I tried this one from KBShimmer.